well.. i've just about run out of options and possible fixes to this. my NFS: Shift has been freezing up online for the past month or two, originally i put it down to the heat that we have been getting here in australia. it only seems to happen online and not offline ( wich i find strange to start with). usually the freeze happens while waiting for the race to load, it sometimes occurs while racing and and when its loading back into the pit but its quite rare. its starting to get a bit frustrating because ic an only get mabye 3-4 races in before it freezes up and i get pissed off. nvidia drivers, sound card drivers, motherboard drivers.. every driver i can think of is up to date and current. i dont know what the hell is causing it. nor what to fix it. After a complete re-install of XP this problem is still occuring. it must have something to do with the game, but how to fix it?? i'm outa of ideas on what to do. I sometimes get a freeze between leaving the room menu and starting the race, where the spinning circular arrows do not spin. I have to abort NFS Shift and restart it. It seems to happen more often during the first few races, then after an abort and restart, it happens less often. I don't know if it's related to lag, syncing issues, or just a game bug. Yes that is what happening to me. but after a reboot of the game, it seems to happen within a few races again.. i was thinking it could be the CPU cores getting too hot. and freezing it up.. but i cant see if its them untill the watercooled Xaser is up and running.. It is very unlikely that your cores are getting too hot is what causes your PC to freeze, those should allow much higher temps than you would get from gaming. Now I understand that it is your whole PC and not only just the game that freezes right? If it is the whole system and not just the game it is a hardware problem for sure. If you are able to click Ctrl, Alt + Delete and minimize and go to windows and open taskbar and close Shift then it is the game that is the problem. I see from the pictures that your GPU is 64 degrees Celsius when you just leave the game - that could be it though. Normally it only takes like 4-5 secs for the GPU to cool down after load. 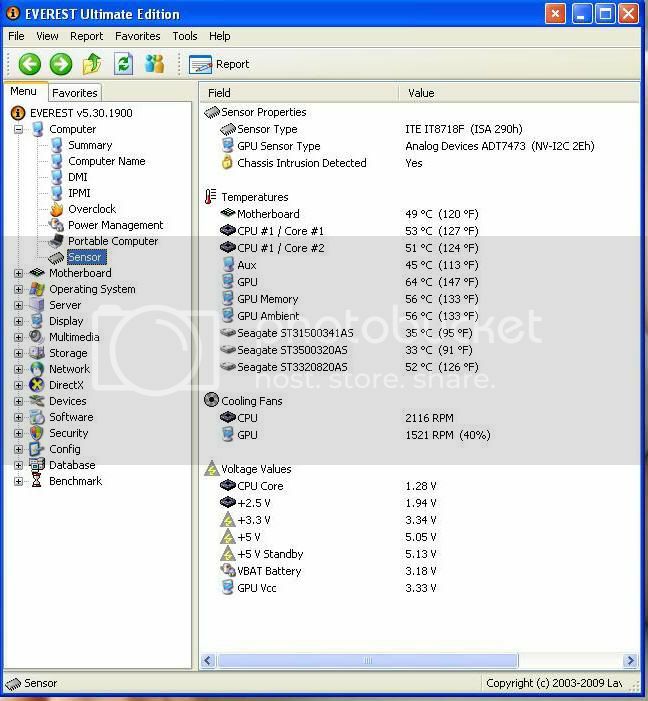 You could use a program like GPUtool to monitor the temperatures while gaming. Just open it and click on sensors and make sure that - log to file and continue to refresh while in background is enabled - then you will be able to open that log file and see what temperatures you had when you crashed. It should at least be 75-80 before that would accure in my opinion, but one never knows with these video cards. I see from the picture you took using Everest, that you only have your fan speed set to 40% on the video card - why? Did you try to set to 100% and test if it still crashes? I can also see that one of your hard disks is very hot - 52 degrees is a lot for a hard disk and it could even be that which causes this - but probably the GPU. I too had some problems with the game freezing up on me, but that was due to too much overclocking on my video card. yeah its the whole PC that freezes up, i'm not able to Alt Ctrl Del and check whats going on... i used to be able to do it when it first started freezing up before the 1.5 patch. but i can not longer do that. yeah i'm not quite sure how to set the GPU fan speed at all.. do you know a way to change the speed? i imagine that it would have to be through the BIOS setup? the 52*c HDD temp is from a external drive, the other 2 drives are internal with a fan infront. You could install Rivatuner to control the fan speed. You just open it and on the main page down below where it says driver settings, to the right of that you will see the option to customize. You click on that icon of a graphics card called system settings and in there you will see fan settings. Just click on direct control and set performance 3D to 100%. Now I suspect that 40% that Everest reads is when not gaming (throttling), meaning it will likely speed up once you do - but just to check out if it still freezes you could use 100% on direct control. 90 degrees Celcius is a lot and I think that is the problem. 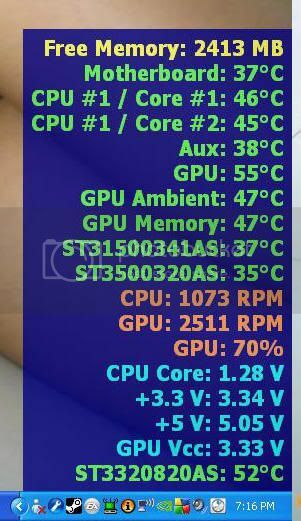 i've instlaled it and ramped up the fan speed up to 70%, now running at 2512RPM and the GPU temp is sitting steady at 55*c and the ambient temp at 47*c , ofcourse this will increase when running the game. but i'll test it out in a sec and see how well it goes.. Install that GPUtool program to check the temps in the logfile after you have gamed some time. righto, i'm sad to report that it still occurs. i loaded it up and went into a unranked match ( i'm sick of getting losses because of this problem).... it lasted 1 x 2 lap race on road america, and 3/4 through the nurburgring before it froze up. GPU temp was 64*c at the time of freezing. That really is strange. What driver from nvidia are you using? I remember I had a problem with one of the latest ones. I changed it back to 190.62 which worked well for me. I am currently running 195.81 and that one has not given me any problems so far. Try changing back to an older driver like the 190.62 and see if that helps. Or maybe its the career file itself. You could try out Jeffs career save file and see if it still happens with that installed. Just rename your current career file and save it on the desktop and when you want to install it again change the name back to what it used to be called. The Nvidia driver i have is 195.62 ( most current). if i remember correctly the driver before had bug fixes for NFS:Shift. i'll run it back to the previous driver and see what happens. Turn off autosave. Win+loss stats are kept in your savegame. If you have autosave off, these won't get updated in your savegame, and the online stats will get reset the next time you load the savegame, or restart the game and complete a race. My game freeze bug is different, as I'm able to ctl-alt-del after a freeze to abort NFS Shift when it hangs. I do think it was that driver 195.62 which should enhance the performance of Shift I had problems with. I too have a GTX 285 and was having a smilar problem, but I just installed today 195.81 and I have played just now for like 2 hours without crashing. I hope its the driver that causes this, otherwise it could be a bugged file in your Shift save files - let´s not hope that though. Running the 191.07 driver didnt last me 1 race. it froze upon returning to the pit. so i'll give 195.81 a go and see what happens i guess. just thinking.. could this me a problem with the actual card itself?